(CNSNews.com) - The federal government raked in a record of approximately $2,446,920,000,000 in tax revenues through the first nine months of fiscal 2015 (Oct. 1, 2014 through the end of June), according to the Monthly Treasury Statement released today. That equaled approximately $16,451 for every person in the country who had either a full-time or part-time job in June. It is also up about $178,156,270,000 in constant 2015 dollars from the $2,268,763,730,000 in revenue (in inflation-adjusted 2015 dollars) that the Treasury raked in during the first nine months of fiscal 2014. Despite the record tax revenues of $2,446,920,000,000 in the first nine months of this fiscal year, the government spent $2,760,301,000,000 during those nine months, and, thus, ran up a deficit of $313,381,000,000 during the period. According to the Bureau of Labor Statistics, total seasonally adjusted employment in the United States in June (including both full and part-time workers) was 148,739,000. That means that the federal tax haul so far this fiscal year has equaled $16,451 for every person in the United States with a job. An additional 3.8 percent tax on dividends, interests, capital gains and royalties--that was embedded in the Obamacare law--also took effect in 2013. 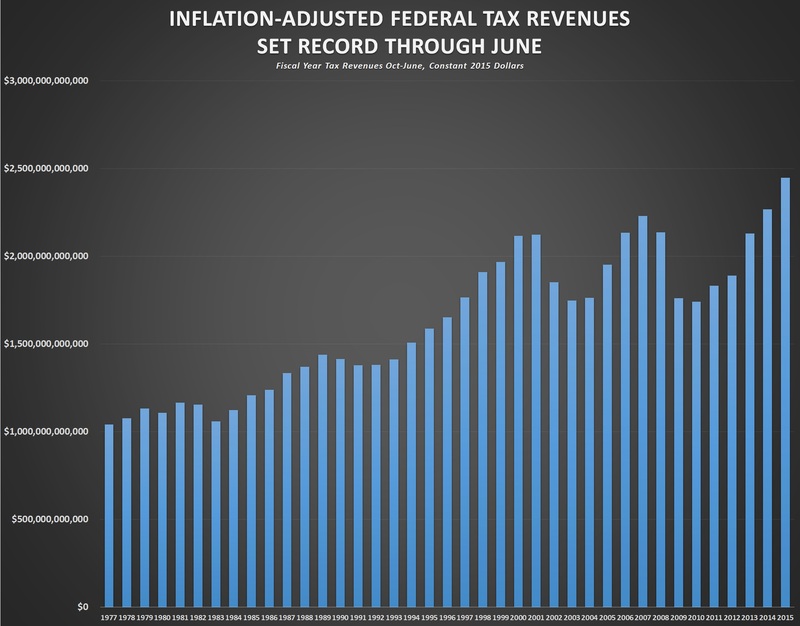 The largest share of this year’s record-setting October-through-June tax haul came from the individual income tax. That yielded the Treasury $1,167,500,000,000. Payroll taxes for “social insurance and retirement receipts” took in another $771,048,000,000. The corporate income tax brought in $255,453,000,000.